In a past article I discussed the importation of a pair of adult saltwater crocodiles Crocodylus porosus from Australia to the United States (CSG Newsletter Volume 23, Number 1, Jan.-March 2004). 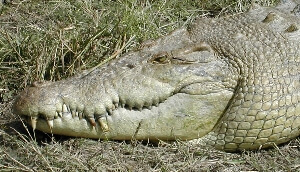 We know that crocodilians replace their teeth on a regular basis and in a very specific pattern. (Edmund, A. G. , Tooth replacement phenomena in the lower vertebrates. Contribution 52, Life Science Division, Royal Ontario Museum, Toronto, Canada). Maximo, our 15’ 3” saltwater crocodile had orange teeth because of the tannins in the water where he lived in Australia. 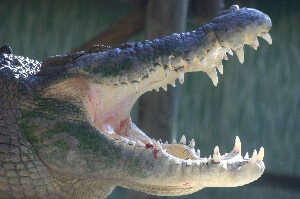 After he moved to the St. Augustine Alligator Farm Zoological Park in October 2003, any time Maximo lost a tooth it was extremely obvious, because the old orange-stained teeth were replaced with bright white new teeth. In fact, we thought it was note worthy that he lost his last orange tooth exactly one year after being brought to our facility. He managed to loose and replace every tooth in his smile in one year’s time.